With recent heavy rains and high inflows of water into the Grand River watershed, both Grand and Hudson lakes are currently above normal elevations. And the United States Army Corps of Engineers has also directed floodgates to be open at Pensacola Dam as part of an overall flood control effort for the watershed. Due to these current conditions, the Grand River Dam Authority Police Department is urging boaters to use extreme caution when visiting GRDA’s lakes. Be aware of floating debris. Higher lake levels can mean more driftwood and debris floating in the water. Please be on the lookout as you are boating. Be mindful of the changing shoreline topography and the possibility of now-submerged structures. Things like stumps, picnic tables, retaining walls and other structures typically located along the shoreline may now be submerged due to the lake levels. Use extreme caution and avoid unfamiliar areas of the shoreline. Stay away from floodgates and spillways. There is a chance that floodgates could be open at both Pensacola Dam (Grand Lake) and Robert S. Kerr Dam (Lake Hudson) as you are boating. If that is the case, please observe the buoys designating the spillway areas and allow plenty of distance between those locations and your boat. Do not go into spillway areas below the dam. Please use common sense and stay away from areas below floodgates where water is being released. The swift water can be very dangerous. If you need immediate assistance, the GRDA Police recommends you call 911. However, if you are on the boat with no cell phone access, you can use Marine Band 16 to radio for help. Finally, a good reminder for boating in all conditions: always wear your life jacket. Additionally, it is important that the public make safety a priority in all areas near GRDA hydroelectric facilities. Whether you are on land or water, the GRDA Police Department wants you to be aware of the following information related to dam safety. Keep in mind that notifications such as signs, buoys, sirens, fencing and flashing lights are all intended to notify those in the area when floodgates are open, generators are operating or water is rising swiftly. Also, it is very important to remember that it is against the law to enter into floodwater releases. Signs: Posted at GRDA hydroelectric facility (Pensacola Dam, Robert S. Kerr Dam, and the Salina Pumped Storage Project) to warn of extreme danger in floodgate areas. Please be aware of other signs near GRDA facilities that notify you of no trespassing areas, no diving areas, or unstable footing. Buoys: Red buoys and cabling above and below spillway gates and hydroelectric powerhouses restrict access to dangerous areas associated with power generation or floodgate releases. Flashing Lights: At hydroelectric facilities, the flashing lights are initiated when floodgates are opened or generation is underway. Fencing: In place to identify borders and to restrict access to certain areas near the hydroelectric facilities. Sirens: These are located at various places on the hydroelectric facilities and are utilized prior to the operation of hydroelectric generators and/or floodgates. For more information on the GRDA Police Department and lake safety, or for information on how an officer can assist you, contact the department at (918) 256 0911 or visit us online at grda.com. You can also follow GRDA and receive the latest lake level information and other updates on Facebook and Twitter (search GRDA), or sign up to receive text messages from GRDA by clicking on the “News” drop down menu on our website, then clicking on the “Text alerts” tab. The service is free. You can also download the “Grand Lake app” to Apple or Android devices and receive the latest lake notifications. Above – Boats of all shape and sizes are out on Grand Lake, near the Pensacola Dam. 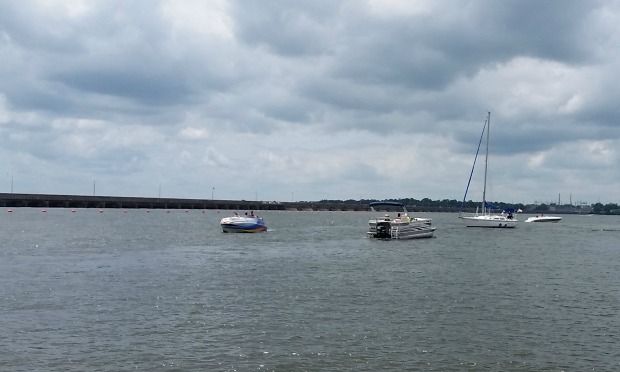 The GRDA Police Department reminds boaters that buoys (like those also visible in this photo) are in place above and below the dams to restrict access to floodgate areas or areas associated with power generation.